The famous Ghandi quote. 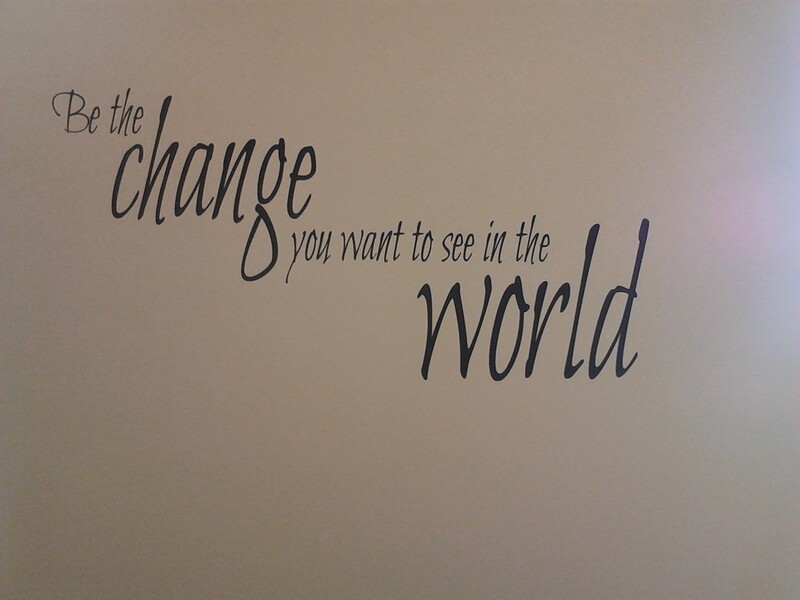 On the wall in our office at SenseAbility Gym. It’s an interesting journey – this special needs parenting gig. When you get your child’s diagnosis, whatever it might be, initially you can feel quite alone. You think no one has a kid like mine. No one will understand the challenges he faces. No one knows what he’s feeling or what I’m feeling. And then slowly you find your village. Maybe it’s in person at the drop off for your child’s special preschool program. Maybe it’s through a support group. Maybe it’s online. At some point, you discover that you are not alone and neither is your child. There are people out there who “get it” and will do whatever it takes to help you “get it” too. I’m very lucky to have found my village both in person and online. I have friends who have helped me when I was lost and friends who understand my children better than I do. We have a team of support, not just for me but for our whole family. And it’s because of that support that my friend Tina and I were able to open our sensory gym. We saw a need and wanted to fill it. We believed in the fact that all children deserved access to the types of therapeutic equipment used in their schools and their private occupational therapy clinics. We wanted the gym to be a place where parents and children could go to socialize with other families who shared similar challenges. To help them find that village. As we started the business, we found that there were other businesses out there with a similar goal. One of these is Fun and Function. It was started by Aviva Weiss, an occupational therapist and a mom of six. She was frustrated by the lack of fun toys for children with special needs so she began creating her own. And now she’s on a mission to make “different” play fun. Who does that? Oh right. Companies started by people who “get it”. After saying something like “Oh my goodness, thank you! This is huge and amazing!” I asked if there was a way that I could interview Ms. Weiss for our blog. I asked her what inspired her to start the business and where the idea came from. Ms. Weiss answered with a familiar answer – she was inspired right at home, by her daughter. Her daughter needed the types of equipment for deep pressure and calming, but at the time all she could find were things that were too clinical looking and/or very expensive. She knew she had to change that and knew that if her daughter needed it, there were other kids out there who would need it as well. We talked about the challenges she’s faced along the way and what kept her going. We discussed how hard it is to start your own business, to find the money to do it, to spend your own money to keep things going. But the mission keeps you going – knowing that you are helping families just like yours. Every word she said rang true for me. It was as if she was saying the words in my head – all the reasons why we started SenseAbility Gym were the same, all the challenges were the same, and the driving force is the same. I asked the question that many people ask us here – is there one thing that could help a child with sensory processing disorder? If you could recommend one product, what would it be? I asked her what those favorite items were and what were best sellers from the website. She suggested their weighted compression vest, the Soft Saddle Scooter, Sammy the Seal Swing, Social Emotion and Guess How I Feel Games, Squishy Gel Cushions, Cool Chews and Bite Bands. 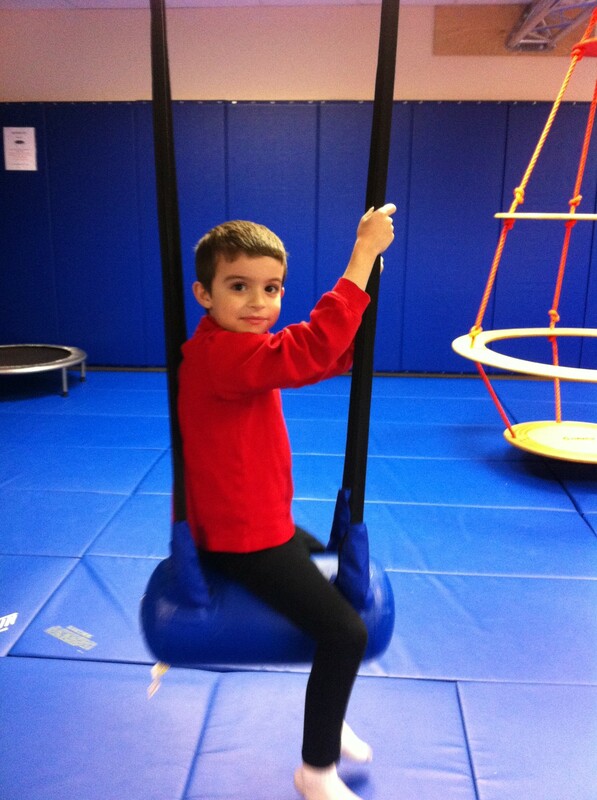 Here at SenseAbility Gym, we’re in love with the Air Lite Junior Bolster Swing. Generously donated to us by Fun and Function. Ms. Weiss and I talked for about 15 minutes until I asked the question that I ask many parents who have older children. What advice do you have for families who are just starting out on this journey? Her answer was the best. Don’t let anyone tell you how to feel or what your child won’t be able to do. It’s okay to grieve and be angry. But then it’s time to get back to figuring out with your child what they need and what can help them. Then anything is possible. Anything is possible. And when you believe in your child and yourself there isn’t anything they – and you – can’t do. Like start your own business. Or your build own community. I am so grateful to Aviva Weiss and people like her who have blazed the trail for parents like me. All it takes is an idea and the will to do it. She found her will by looking at her daughter. I found it by looking into these eyes here. We’ve been together a while, me and you. A little over five years now at this point. And you know how I feel about you. Addicted from the start. Heck, I wrote about you and it was my first published piece – in The Boston Globe Magazine no less. I’ve tried to quit you but I can’t. I have too much personally invested in you: time, friends, and relationships. I can’t walk away. Professionally, however, you’re making it really hard to stay. So here’s the thing, Facebook. I’m a small blogger with a small audience. I have a fan page with about 700 “likes”. They are truly mine. I didn’t pay for any of them. These are people who decided that they like what I write about my family and about our journey and they want to read more. I am incredibly grateful for each and every one of them and they are my online support group and community. Because of my readers I have learned so much about my children, about autism, about sensory processing disorder, and about being a parent of three boys. Many of my readers have become my “in real life” friends, without whom I would be lost. I share my personal blog posts on my blog’s Facebook page for that community. I also share others’ posts there too – many talented writers who are on the same journey because I love what they have to say and know others would as well. Not only is it a way to spread awareness, it keeps my personal Facebook page from getting filled with articles that half of my friends don’t care about. So when I look to see that only 100 of the 707 people who like my page have seen my last post? I’m at a loss. Additionally, I’m a small business owner. Of a small nonprofit. 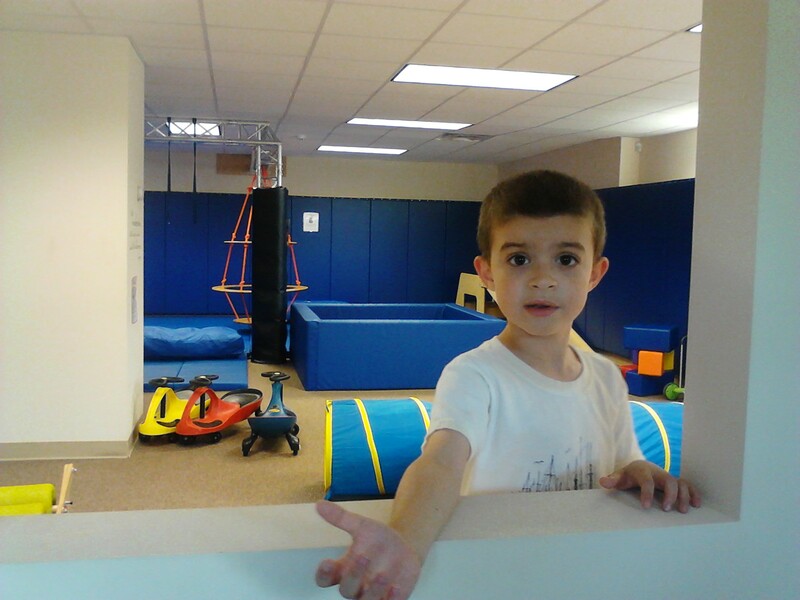 We serve our local special needs community with our indoor sensory gym. SenseAbility Gym has a Facebook business page where we have our hours, pictures of our equipment, and a “check-in” feature for families who visit. On that page, we have 872 “fans”. Many of them are our customers, many of them are also our donors. We have a very small controlled budget. 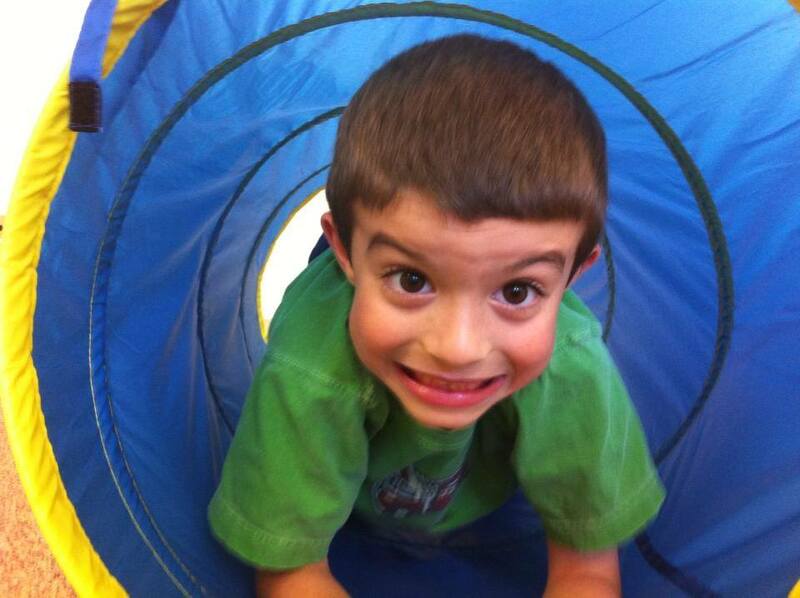 We are funded only by donations, grants, and the fees that families pay when they visit us. We are playing with other people’s money. We use our Facebook page as it was meant to be : a social media connection to our community. We share our class offerings and our hours, but also inform people of local sensory friendly movies, plays and activities. We built this place to connect families in our area. Because we have little (no) advertising budget, we rely on word of mouth and social media to inform families about us and to stay open. Additionally, we need that online connection to the local businesses and organizations generous enough to support our mission. So when I look and see that only 94 people saw our photo about our free yoga classes for kids with special needs and 303 people saw our post thanking families for joining us for our holiday party? I just don’t get it. Do photos get more or less visibility? Do I share a link in the status or the comments? Do more comments equal more prominence in someone’s newsfeed? Do I write in all caps? I don’t really know what to do here, Facebook. I get that you need to make money. I really do. You’re a business and you’re not the Facebook of five years ago or even two years ago. You have investors to answer to. You have ads to sell. I get that the point is trying to get us to “boost our posts” by paying for it. But we’re not Pepsi with 30 million fans. They have a market they need to target and they have a need to expand their fan base to buy more of their products. They have the money to do it. And yes, I get it. Some bloggers do make money as do some nonprofits. I know that. But I use my blog page and our business page in the same way that I use my personal page. Connection. Community. Communication. We’re not looking for inflated fan numbers to spread our brand. We’re looking to get the information out to the people who chose us and who are truly interested in getting information from us. I will not pay for my blog posts about my son’s great day at school to be seen by more people. Additionally, I can’t in good faith use donations and grant money to boost our business’ posts to let people know when we’re closed for a snow day. I don’t want to pay for our fans’ friends to see our latest piece of equipment when they have no interest in our mission. I just need to communicate with the people who actively choose to hear from us. All of the people. So what do I do, Facebook? How can I keep using you in the way I need to? There has to be a way to separate the bloggers from the newspapers, the Wal-Marts from the SenseAbility Gyms. There has to be a way to categorize us differently. Share the algorithms for newsfeed visibility so we know what to do. You need to be transparent for your investors. Be transparent for your users. Help a mom out here, Facebook. My husband told me the other day that people don’t fear change. They fear the uncertainty that comes with change. That’s what I have here, Facebook. I fear losing the community that I worked so hard to build and the business that I have put my heart and soul into creating. These aren’t just online names to us. They are our friends. I need them and they need us. Please don’t say Google+. Please. In the meantime, I’ll remind people that they can follow me on Twitter at @trydefyinggrav and @SenseAbilityGym. I’ll let them know about our day or our latest community project in 140 characters or less.